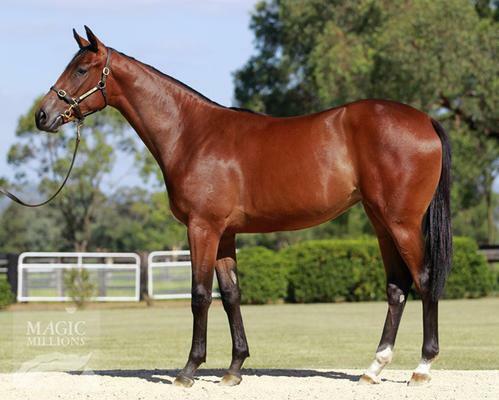 Tony in conjunction with Laurel Oak struck again on the Gold Coast when they secured Lot 527, a very athletic STARCRAFT FILLY out of the STAKESWINNING REDOUTE CHOICE mare CHIC CHOICE, with this lovely filly being knocked down to them for $170k. She was purchased to a specific order with 50% being covered at the time of purchase and another 20% allocated immediately after the fall of the hammer. She is an ideal racing and then future breeding proposition, with each of her last three dams are black-type performed mares, currently all of the 70% allocated to date is with clients who intend to be involved in her future breeding career down the track. So with only 30% currently available as we write this, if you are interested in obtaining a share in the filly you will need to contact Boo or Tony sooner than later. We also expect that an opportunity to lease part of this filly may become available.